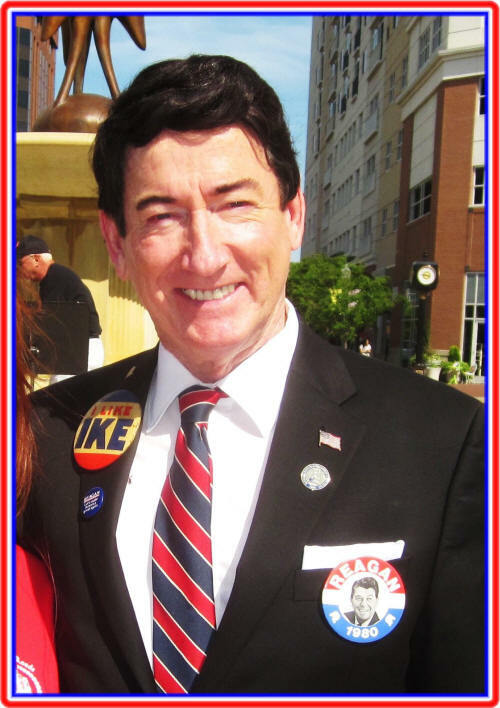 Tim Beasley returns as "President Ronald Reagan" for inspirational and motivational speaking engagements in his remarkable celebrity impersonation of the popular US 40th President. 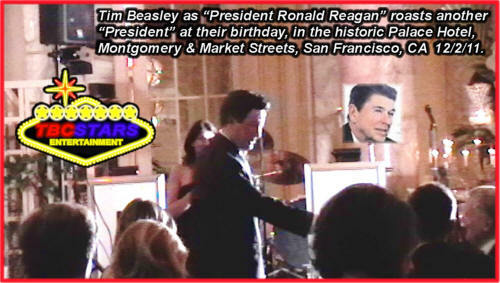 Great for all American theme, political or historical special events, as President Ronald Reagan was declared by popular vote as one of the top 5 Presidents of the 20th Century. There are several unique flavors of appearances, just like President Reagan's favorite candy, Jelly Bellys! 1. 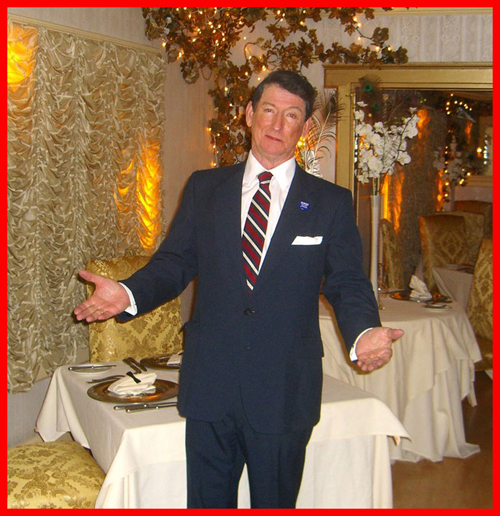 Meet & greet with an after-dinner speech from the Oval Office podium, and yes, we have a replica of that! 3. General entertainment subject for speaking program can be "The Wit, Humor and Wisdom of President Ronald Reagan" based upon the many books on this subject. 4. Inspirational and motivational subject for educational speaking at colleges, high schools public libraries, political rallies. 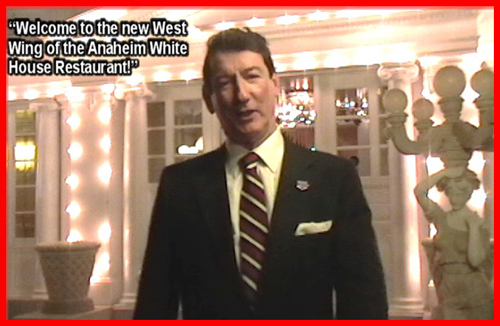 Having a "President's Day Sale" or special sales/ marketing event?“ "President Ronald Reagan" will cut ribbons for grand openings, make motivational speeches for your "corporate congress" and get your marketing and PR messages across as " The Great Communicator !" 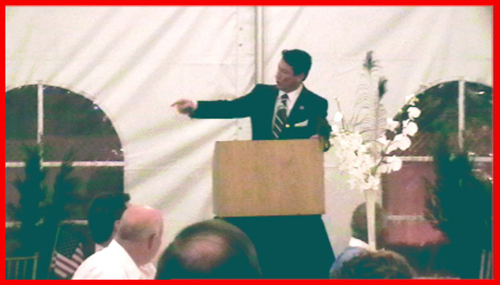 Also, with Reagan's legendary wit and good humor, he's a grand guest speaker for having some "roasting" fun, much like he did as guest on the now classic Dean Martin's Celebrity Roasts. 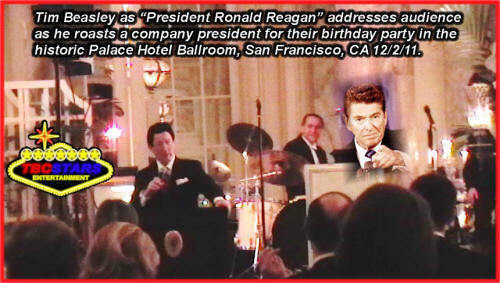 The two photos below show "Ronnie" in action roasting a big Republican businessman for his 50th birthday party in the grand ballroom of the historic Palace Hotel in San Francisco, late 2011. For a fun and fabulous roasting engagement, he will deliver a 'this is your life" style of commentary on your special "Man or Woman of the Hour," based on your and your colleagues best and illustrious stories of the person's "good, bad and ugly," in a good humored way, full of hilarious quips....Your roast-ee should know that being roasted is indeed a high honor, and a testament to their good nature. 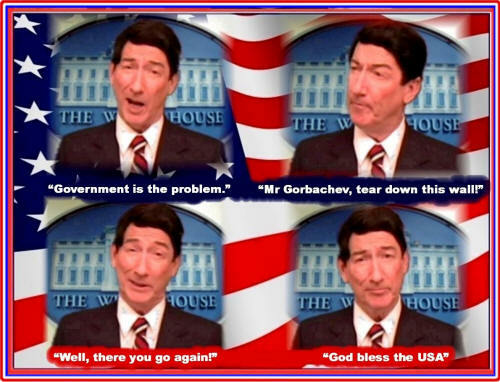 Let "President Ronald Reagan" be your time travel ticket master back to the great 80's! 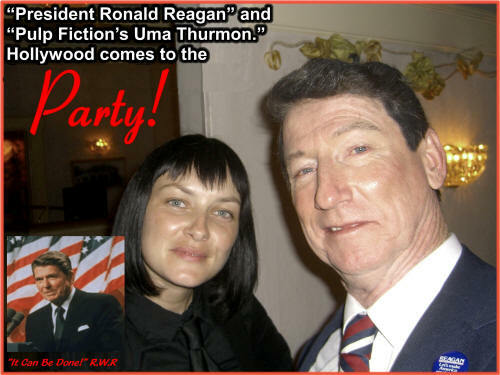 As the leader of the free world from 1981 -1989 he was there for "MTV, .E.T. , The Breakfast Club, The Terminator, The Big Chill, Ferris Bueller's Day Off," New Wave Music and so much more! Nothing beats the fun and excitement of a "Presidential Personal Appearance!". Call or e-mail for discussing your event. Appearance rate quotes are based on date, location, times, etc.